PCE Instruments: In laboratories as well as in the industrial sector, a pH meter is often required to measure the hydrogen-ion activity in water-based solutions. The hydrogen-ion activity is indicative of a solution’s acidity or alkalinity, which is expressed as pH. The right pH electrode must be selected carefully in line with the measured medium as it will be directly in contact with it. The PCE-228 has been part of PCE Instruments’ product range for many years now, with several extra probes apart from the pH probe. The basic model PCE-228 comes with a PE-03 pH electrode and a temperature sensor and a variation of that model, the PCE-228M, is available with the CPC-OSH-12-01 pH electrode for meat and other food products. Another existing variation is the PCE-228-R that includes the ORP-14 electrode for Redox measurement whereas the long-established PCE-228S pH meter comes with the PCE-PH-ES electrode for pH measurement in soil. For all four of these, the other electrodes are available as an option and the temperature probe is included in the standard delivery. The PCE-228SF pH meter measures pH values on surfaces with its ERH-115 electrode and also comes with a temperature probe. Measurable surfaces include skin, paper and cardboard, textiles, etc. This pH tester also measures very small sample volumes, starting from 0.1 ml. To do so, a special cuvette is needed. The cuvette is also included in the standard package of the PCE-228SF pH meter. 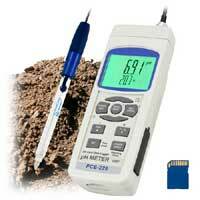 The PCE-228LIQ comes with the PCE-PH-LIQ electrode and the standard temperature probe, as all other models. The PCE-228LIQ is used to measure pH values in beer, blood and some dairy products. The pH tester PCE-228SLUR comes with the PCE-PH-SLUR pH electrode for measuring pH in mud and soil and a temperature sensor. In cosmetics, where it is very important to know that the pH value of a product like shampoo, hair dye, body spray, etc. matches the pH of the skin, the PCE-228P will be the right pH meter to choose. It comes with the IJ-44C pH electrode for cosmetics and the temperature sensor. As with the older models, the electrodes are also interchangeable with the new models. All models described above are available with several accessories like solutions (storage, calibration, cleaning, etc. ), different types of mains adaptors, an RS-232 to USB adaptor and more. An ISO calibration with certificate can be purchased at an extra charge.